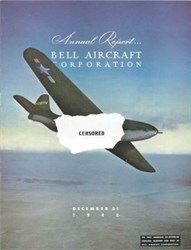 Bell Aircraft Corporation 26 page Annual Report issued in 1943. This historic document has a picture of a jet aircraft on the cover with the engine and payload covered with "censored" and is over 60 years old. This report includes lots of pictures, charts, graphs, and financial information. This report was issued during WWII so the report was geared towards the company's contributions supporting the war. Bell Helicopter Textron, a subsidiary of Textron Inc., is a $1.6 billion, leading producer of commercial and military helicopters, and the pioneer of the revolutionary tiltrotor aircraft. Globally recognized for customer service, innovation and superior quality, Bell's global workforce of over 7,500 employees serves customers flying Bell aircraft in over 120 countries.